Kempe Gowda I was born in 1513 in a village near Yelahanka. He was a chieftain under the Vijayanagara kings, and was as ambitious as he was capable. He studied for nine years in a Guru Kula near Aigondapura (present day Hessaraghatta) where he learnt statecraft and martial skills. Kempe Gowda visualised building a city that would house a military cantonment, water tanks, temples, and provide employment to tradesmen. He approached the Vijayanagara kings for the requisite permission and laid the foundations for what would become Bangalore City in 1532. The planned city had eight access gates and wide roads and the settlement spread across present day Avenue Road, Ulsoor, Yelahanka, K R Market and Malleswaram. Kempe Gowda built a number of tanks and ensured the just and equitable collection of revenue and taxes. Agriculturists and traders could operate without fear under Kempe Gowda’s reign. He built a watchtower on a granite hillock which stands to this day in present day Lalbaug. He is also credited with building the Basavanagudi Bull temple, Ulsoor Someshwara temple and Gavi Gangadhareshwara temple, all of which stand strong to this day. Kempe Gowda won the approval of the Vijayanagara kings who bestowed on him the villages of Ulsoor, Begur Hobli, Varthur, Jigni, Kengeri and Kumbalgod among others. In the early 1550s, besides expanding the frontiers of the empire, Kempe Gowda also struck coins known as Pagodas. He incurred the displeasure of the Vijayanagara kings for this and was imprisoned for five years. On being released, he was awarded back his territories. After his release from prison, Kempe Gowda built the steps leading to the Shivasamudra temple as a mark of gratitude. Kempe Gowda was a patron of the arts and authored ‘Ganga-Gouri Sallapamu’ in Telugu. Kempe Gowda died after a reign of three decades in 1570. As a mark of respect to Kempe Gowda, the Government has named one of the main roads in Bangalore as Kempe Gowda Road. 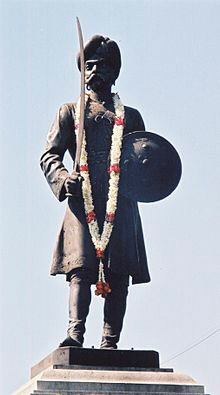 A metal statue to commemorate the founder of Bangalore has been installed at Corporation Circle in Bangalore where it overlooks the bustling metropolis that has grown from the disparate hamlets which Kempe Gowda once ruled over.